Miami-Dade County is addressing its sea level rise vulnerability from the ground up. Areas across the county, beyond just the coast, are vulnerable to rising sea and groundwater levels. Onsite septic systems used to handle wastewater located in low-lying areas face particular challenges, as septic system drainfields must be above the groundwater table and remain unsaturated to function effectively. 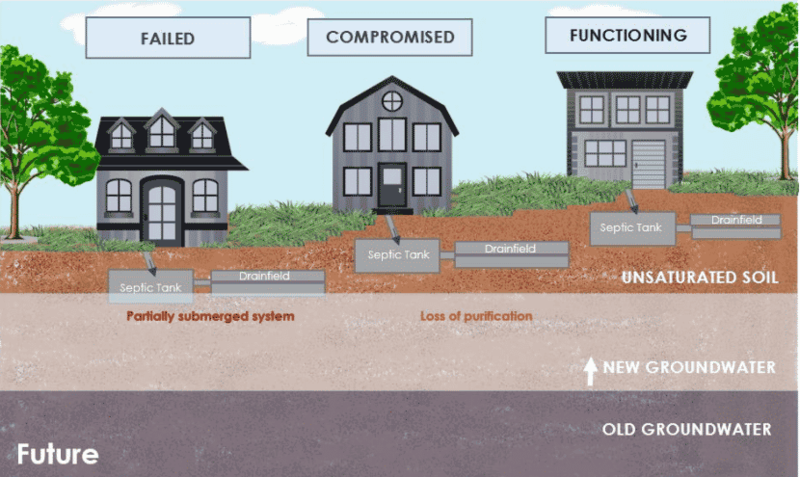 Compromised septic systems have both public and environmental health risks, including potential contamination of potable water. A recent report, Septic Systems Vulnerable to Sea Level Rise, concluded that by 2040, many areas within Miami-Dade County will experience groundwater levels within half a foot of the surface for more than 25% of the year, compromising the ability of septic systems to function properly. The report is the result of Miami-Dade County’s Board of County Commissioners directing the county mayor to assess the impact of sea level on county-wide septic system infrastructure, in alignment with the Regional Climate Action Plan recommendation to identify and quantify infrastructure and populations at risk to sea level rise and storm surge. The report identifies current and future vulnerable areas, and outlines potential approaches to limit vulnerability through infrastructure improvements and policy changes. Subsequent work is needed to identify the appropriate mechanisms for local governments and property owners to manage the potential costs associated with these impacts and improvements.